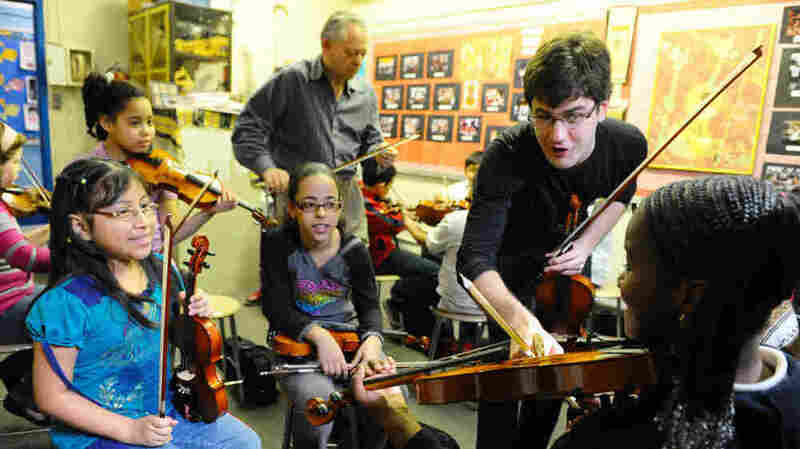 With A Little Help, Violin Students Get To Carnegie Hall Nathan Schram, a musician with Carnegie Hall and the Juilliard School's prestigious Academy program, helps the violin students at P.S. 75 — an inner city school in Brooklyn — prepare to make their Carnegie Hall debut with the prestigious St. Luke's Orchestra. Nathan Schram instructs students in the classroom. Last October, Nathan Schram was giddy with anticipation. He was only a year out of Indiana University and he'd just joined a prestigious program, designed to help classical musicians like himself take on the challenges of building a 21st-century career. He's doing it through the Academy, a program of Carnegie Hall, The Juilliard School, and the Weill Music Institute in partnership with the New York City Department of Education. But the Academy's philosophy is that it isn't enough to be an excellent musician; success depends on also being an educator and ambassador for classical music. So there he was at P.S. 75, an elementary school in the immigrant and working-class neighborhood of Bushwick, Brooklyn, describing how he felt when he got the invitation to join the Academy. "I was thrilled. It sounded great. It sounded like it was gonna help me communicate better with audiences," Schram says. "I was gonna find a newer audience. I was gonna help people that might otherwise not be able to experience this music — and maybe I could learn something from them, too. And now I'm here. Day one." Many, many days have passed. In late May, Schram was coming toward the end of the academic year at P.S. 75. "Well, the novelty of me coming here has worn off a little bit," Schram says. "I'm not the special character I was; I'm kind of the other guy. But it's great. I mean, they — I mean, it's nice coming in here and building a relationship; seeing the kids that may be struggling one week all of a sudden really doing incredibly well the next week." Schram and P.S. 75's dedicated violin teacher, Zelman Bokser, were helping students in the fourth- and fifth-grade classes prepare for the Link-Up program, where the kids would appear onstage at Carnegie. Bokser says the kids had to learn seven new pieces of music to perform in just five weeks. "It's a little bit of a scramble. It's all — none of it, for this particular group, none of it is a stretch, technically," Bokser says. "It's all less difficult than the things we had done before. But learning so much of it in such a short time, that's a big scramble, and they have to know it from memory." The fourth-grade class couldn't wait to get to Carnegie Hall. "I was really surprised, because we never, ever, ever been to play to Carnegie Hall in our lives," says Petal Jadeo, a student at P.S. 75. "But when we hear about the news, like, we were excited and surprised." The P.S. 75 kids, decked out in new T-shirts, shared the stage with the Orchestra of St. Luke's and some other schoolkids, while Carnegie Hall's vast auditorium was filled with students from all over the New York area, most of them carrying recorders. The program was called "The Orchestra Sings," and when the time came, the kids played their hearts out. Afterward, the P.S. 75 students went to Central Park to eat some lunch and let off some steam. "I felt very excited, but when I was looking at the people, I was like, 'Whoa!' — more than 1,000 or 1,500 people were there," says Lizbeth Nunez, another student from P.S. 75. "And I looked outside — it was, like, huge. I was, like, 'Whoa.' And I was nervous, too, at the same time, 'cause I'd never been to Carnegie Hall, playing onstage." A week later, sitting in a practice room at Juilliard, Schram reflected on his year in the Academy — on all his new friends and colleagues and incredible performance opportunities, but also on his experiences at P.S. 75. "I've never been an educator before in my life. This has been a real adventure working with the kids," Schram says. "I just had my last teaching day today, and it was certainly bittersweet — it was definitely, hands down, the hardest part of the program." Throughout his fellowship year, Schram performed in a lot of places, with some of the biggest names in classical music. But, unlike his students, he didn't play onstage in the main auditorium at Carnegie Hall. "They've trumped me! They take the cake! They've performed in the biggest, greatest, most famous hall in the world," he says. "I'm still working on it." He'll keep working on it next year, when he completes the second year of his fellowship with the Academy and his work at P.S. 75.